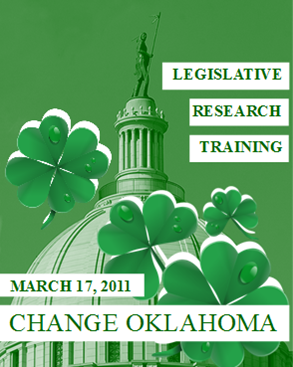 Join Change Oklahoma on Thursday, March 17, 2011, from 12:30-1:30pm. We will be meeting at the Oklahoma State Capitol Building, in Room 419A. From the Introduction and First Reading of a Bill to its Filing with the Secretary of State, come learn the path of a new law in Oklahoma. Let's find out how an idea becomes law. Wear green! Space is limited. Please RSVP to Susan McCann at 405/203-7544.